A look at the headlines and it would be safe to assume high street labels are playing catch up with online competitors  and falling swiftly behind. Fashion brands that were once a pit stop for shoppers in most UK towns  including the likes of La Senza, Jane Norman, Barretts and JJB Sports  are now either facing administration or have only the void gift cards to remember them by. 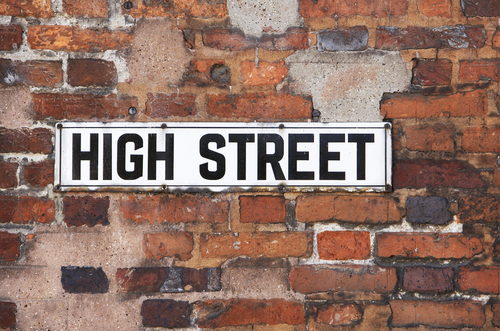 High street woes have largely been put down to the growth of online retail  and this is true, to an extent. Now were a nation of smartphone users (50% according to recent estimates) its possible for the average shopper to try an item on in-store and buy for a cheaper price online, cutting down on costs and queuing times. Stores are always closing  and reopening  but this time the pace of change is considerable. The think tank Centre for Retail Research recently made the gloomy estimate that the total number of shops by 2018 is expected to fall by 22% over the next five years. But ecommerce can be a huge boost to brands on the frontline. Digital shopping has gone offline  customers can order for in store pick-up, social media marketing has boosted retail sales, and online chains are beginning to recognise the brand value of having a high street outlet. Getting a bargain is no longer a matter of trawling the town to find the best deal  shoppers can find the lowest price of an item with a few taps of their phone. Smartphone Apps like Pricegrabber, BuyVia, RedLaser, Amazon Price Check and Shop Savvy do all the hard work. While this tactic works well with technology products, this is a problem facing fashion chains as well  flagship stores can be demoted to showroom status, while online outlets sell branded items for less, or at least without the hassle of carrying it home. Charging customers to try on an item has been a tactic trialled by designer names in the US and Australia. Vera Wang recently ended charging customers in China several hundred dollars to try on their high-end wedding dresses. A handful of stores in Australia started charging customers to try on clothes in 2011 to combat falling sales. Expecting shoppers to cough up to try on their goods sounds like a scheme dreamt up by Ryanairs marketing team. Its a sure route to a PR disaster for any high street chain, but nevertheless demonstrates the ultimate edge of the high street  the immediate availability of goods. But if the draw of getting a garment on the day from the high street is not enough to keep retailers going, its the work of online retail that can get shops back on track. Unbeknownst to shoppers, online deals and discounts may really be designed to get more people through the door of the high street outlets. Faced with the choice of paying £4-£10 to have that summer shirt delivered, or for free in-store delivery, which would you be most likely to choose? Its also possible for a brand to reinvent itself using ecommerce without alienating its traditional consumer base. Hobbs, the upscale womens fashion chain, began selling its NW3 range as a separate label aimed at the younger demo on fashion ecommerce store Asos. The brands chairman Iain Macritchie praised the multi-channel approach. While we anticipate conditions will remain challenging for the retail sector over the coming year, we are looking forward to continued growth across the business, he commented after posting record sales in December last year. If shoppers are treating stores like showrooms, why not give them the experience of an exhibition? Designer glasses retailer Kirk Originals created a shopping art gallery at its flagship store in London, featuring a series of blinking cartoon eyes wearing the branded glasses to create an atmosphere thats tough to recreate in the digital sphere. Think about a High Street store as an interactive billboard; the brand name, logo, and its wares being displayed at centre stage across the country. Amazon has managed to do this effectively without having a storefront  the brown smiling package is easily recognisable to UK shoppers. Brands that combine ecommerce and traditional retail can combine their online/offline presence for effective marketing. Jimmy Choos eclectic Trainer Hunt had Londoners on a real-time treasure hunt using the retailers Facebook page, Foursquare and #CatchAChoo hashtag. The agency responsible for the campaign, Fresh Networks, estimated the Choo Trainer Hunt increased sales by a third both in-store and online. Jimmy Choo effectively used its social media presence to boost its offline brand awareness, encouraging online fans of the brand to turn up to the store and events related to the campaign. Its also the in-store experience that is an important part of building brand reputation and trust. When looking to buy from a retailer, were much more likely to go on what others have said about the service rather than online advertising. Almost half (46%) of consumers trust a brand based on online reviews, while just 10% respond to ads on websites and social media, according to research by Forrester. Online videos and chat logs can be a big part of providing positive customer service, but face-time at a store is still the most effective way for customers to feel the personality behind any brand. Fashion retailers like Topshop and Oasis use their websites to allow customers to book time with a personal stylist, and perhaps get them to purchase items instore they would not have otherwise bought online. Ecommerce growth is outstripping traditional stores  Visa estimated that online purchases grew by 11.5% last year in the UK compared with 6.1% overall, representing almost a quarter of total spending. Watch this space for more insights into the digital and offline impact of ecommerce growth.